After nearly a full year, 329 days to be precise, it is official. 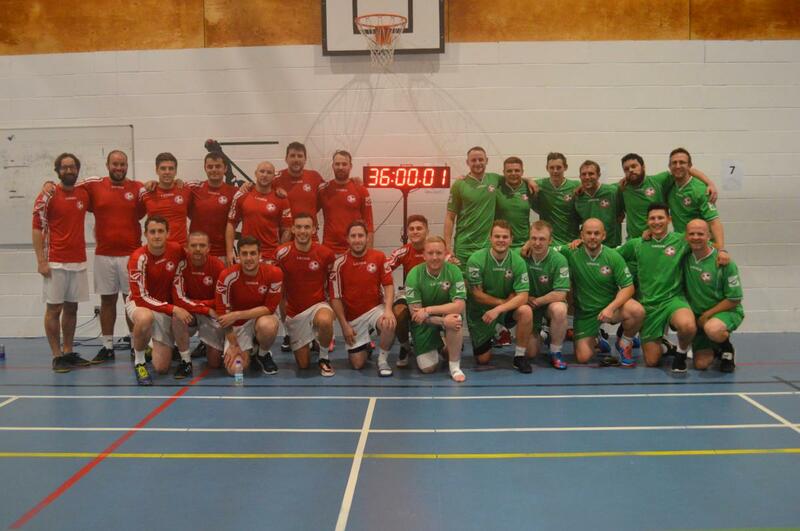 Twenty five of my closest friends and I became Guinness World Record Holders – 36 hours of Indoor football in the bank, £13,500 pounds donated and a load more grey hairs in the process. If you’re thinking of trying something similar here is my guide to organising a World Record! No idea is too crazy, but lots will tell you it is! Wanting to help after my sister, Vicki, was diagnosed with breast cancer the second time seemed only natural. It’s a family member, you love them, why wouldn’t you help and of course wanting to do something positive in such a negative situation seemed obvious. However, I could have raised money through all sorts of avenues, but if you are going to capture peoples imagination and hit a large target, then it seemed I had to go big! This was nothing to do with me showing off… Honest! The exceptional people I asked to do this with me didn’t hesitate, yes there were a few that couldn’t make it and some that didn’t think their bodies would cope. By and large though, these men came through for me, although I don’t think any of us realised how much that friendship would be tested in that sports hall! I could not begin to tell you how many e-mails, letters and phone calls I made trying to get sponsorship, kit, food & donations. You name it! Some would respond, some would ignore. Those that responded would often politely decline, no problems with that, there are so many good causes and all of them need help! However, many, could not have been more helpful. The list of people that gave us stuff is extensive and would take up a lot of room on this (they are all on our website if you would like to look at the wonderful companies that helped) and to all of those people at these companies, THANK YOU SO MUCH, everything that was given helped and you will not know how much of a lift it gives you when someone just replies, never mind says yes to helping you. Trust me when I say this, nothing is too small that it doesn’t help! World Record Attempts are BLOODY hard! Organising anything can be difficult, really difficult. I like to pride myself that when I put my mind to it, I am pretty good at it though, the little details are the key and planning for every eventuality. I am here to tell you, IT IS IMPOSSIBLE to plan for everything with this. If you want to organise a world record attempt for longest time doing anything – be warned, it is tough! Organising witnesses that you don’t know to give up large amounts of their time is unbelievably hard. Especially if some of that time is 4 o’clock in the morning. Asking people to come and referee for four hours, which seems short in the 36 hours, but is still over 2 football matches in a row is a big thing to ask! I asked five different venues, thinking that they would all jump at the chance to have the publicity I hoped a world record would bring and if not for that, to help charity – I was met with resistance all the way. That is until one man stepped forward, Steve Kirby. Steve volunteered without payment, to open up Lewis Boys School, assured the school he would be there at all times and then spent 36 hours unselfishly helping witnesses, referees, players and supporters a like. The world needs more people like Steve and there truly will never be enough thank you’s for what he did! The collation of everything and submitting it to the world record company was silly, I hadn’t even thought of the amount of organisation that would be needed post attempt. Labelling 2 minutes of footage for every hour when you have four cameras that all film different areas of the hall. Scanning all the log books (200 pages front and back) and finding a way to send over 144 hours of camera footage to the adjudicators will age you considerably! I did not do this alone, admittedly and the thanks for this will come later, but do not underestimate what is needed after these attempts – it will blow your mind! Before the attempt the existing record was at 30 hours and 10 minutes, a long-time of course, yet when I was planning this, I could not help but think, if you’ve gone for that long, what’s another five hours. 26 people (yes myself included) hated me for asking that question. Imagine doing some exercise for 6 hours… ouch! Now imagine doing it after 30 hours of already doing that exercise. I was genuinely scared to get the ball as team mates and opposition alike would happily have kicked me and not the ball – luckily they had very little energy! Every hour seemed to go quite quickly, but when there are so many of them, that doesn’t quite seem to matter. I will warn you, you will go through some very dark times during this, your brain is exhausted, every inch of your body is screaming for you to stop and there’s a bloody big clock telling you to keep going for another ten hours please! The list of thank you’s is long and hopefully no one has been missed, however, those two words just aren’t enough! From the 12 witnesses (Kate, Hadley, Sophie, Glenda, Ben, Ian, Katie, Gareth, Steven, Jonathan, with special mention to Rachel & Giles in particular for their 36 hours combined witnessing!) to the referees, Graham, Ashley, Kev, Richard, Nathan, Pete and Dan. I am forever grateful. There are two further groups that cannot go unmentioned, my family and our supporters! My dad deserves an unbelievable amount of praise just for getting Sam back on the pitch each time. Always there to advise on the ailments, make sure players had eaten and were hydrated – even making a couple of them smile, Mr Banks you are a hero! My mum played an equally heroic role, the supporters we had were catered for, the players never wanted for anything, the transitions of the witnesses and referees was seamless and the encouragement was ever present, she even managed to get me a little interview on the radio to drum up some more support! Thank you both, you are exceptional! Then there is our 27th player, Lucie. First of all she supported my crazy dream, then helped make it a reality, staying up till silly o’clock helping me plan. Taking photo’s during the attempt, ensuring the coordination behind the scenes was so smooth and then trawling through hours of footage and log books to get the paperwork submitted. If anyone else deserves the title of World Record Holder it is her! The other group was the family, friends and strangers that came to watch and cheer us on, none of us could quite believe the numbers of people on that balcony as the time ticked down to 36 hours and remembering the cheers as we did the final substitutions still sends shivers down my spine! We had people playing us music as 2am, we had people throwing energy drinks to us, rushing off to shops for whatever craving we were having in our delusional state, literally hundreds of people came and went at all hours and all of you will have picked us up in some way while you were there! “I went to see some crazy blokes playing a world record 6-a-side” He didn’t know any of us and didn’t know Paul was linked to the event, he just wanted to offer some support! I have talked throughout this process and journey about my sister and her battle, if you are going to undertake this, you need a really strong reason, inspiration and motivation to get you through the dark times. My sister is that in abundance! I don’t want to play down what she goes through on a daily basis, but to meet her, you would not know it. I mock her, I laugh at her, I laugh with her and more importantly I love her to pieces! What I loved most about this was watching 25 other people that had never met her be inspired by her also. She has that ability and I am so very lucky to have her as my sister. So there it is, a few simple points to organising a world record of this type, as you can see, it begins with one person having an idea. However, you will need so much more than that and I know I have said it a lot above but thank you just doesn’t seem enough. It was so hard and yet I would do it all again tomorrow and am already planning the next one. Unbelievably I think enough time has passed that I may just have some friends back to help me! I am eternally grateful if you donated food, equipment, drinks, time or money, all of it helps. The successful World Record Attempt has been credited to Kicking Off Against Cancer, you were all a part of this and should all feel Officially Amazing! Thank you so much for letting me talk at you and for all you have done so far, please continue your amazing support and I look forward to not being able to thank you again in the future!